Chubb Hotel, a wonderful venue located in Lafayette Hill, has one of the most unique and gorgeous reception spaces. The combination of the brick walls and beige curtains draped on top creates a modern feel with some chic element. The bright red uplighting adds a lot of vibrancy and warms which always works great for reception photos. This photograph was taken at the wedding reception held at the Chubb Hotel at the beginning of September. The celebration was in full swing and there were so many great moments to document. The bridal party raised their glasses after the father's of the bride speech. 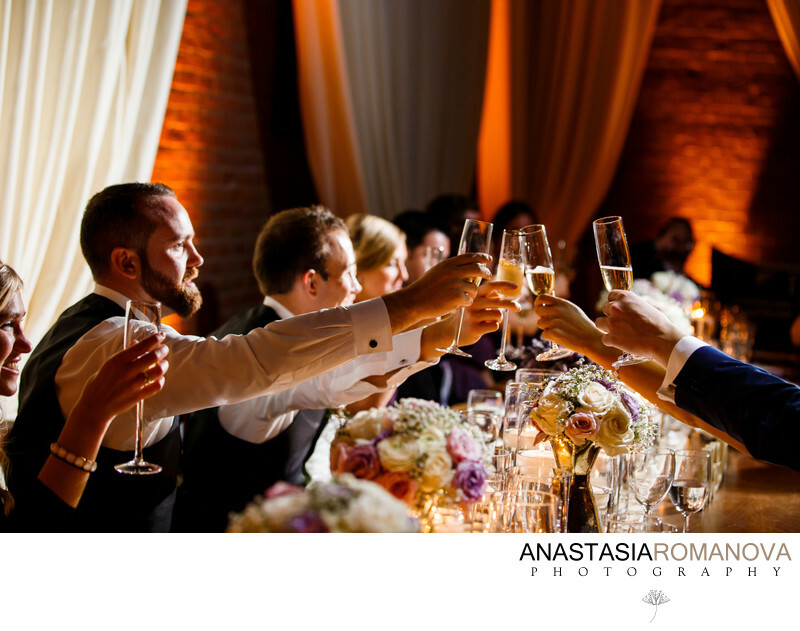 When photographing the toasts at the wedding reception, it is important to have both angles documented - the person saying the speech and the newlyweds and the guests. When there is an action, there always is a reaction following it. And it is our job as wedding photographers to capture as many of those reactions that render the spirit of the day in a genuine way. Even though the reception room was pretty dark and the only light available was coming from the walls uplighting and the candles, one off-camera flash was sufficient to lit the scene, highlighting the champagne glassed. ISO 500; 70mm; f/3.2; 1/80 sec.